As a result of improved production capacity through technological innovation and rising global demand for marine products, marine fisheries production and international trade in fish and seafood products have increased dramatically over the past six decades. These developmental trends have transformed fish economies at the local, regional, and national level, creating new geographies of production and exchange relations. The intensification of global economic relations within the fisheries sector raises a number of interesting questions about the structure and functioning of local fishing economies and implications for fisherfolk livelihoods around the world. In this paper, we ask: In what ways has globalization had an impact on fishing communities and household livelihoods? How have these impacts differed for men and women? And, in what ways are fisherfolk households responding to these gendered impacts in terms of livelihood strategies? We investigate these questions through case study research in three fishing communities in Kerala (India) conducted over several extended field visits between 1994 and 2005 and follow-up visits in 2008, 2011, and 2015 in which we examine how globalizing trends and processes impact local labor processes, how local gender ideologies give specific form to such impacts, and how the livelihoods of different individuals and households are thereby affected. “Globalization” is defined here as a set of trends and transformations through which local systems of fish production, processing, and trade become increasingly organized and spatially integrated into global-level trends and processes—or, into what we call the “Global Fish-Food Economy”. We argue that globalization in the fisheries plays out differently for men and women in different fishing communities as a result of different configurations of gender, work, culture, identity, and economy and the different ways households and communities are connected to fish economies at different scales. The theoretical framework for this project draws on feminist commodity chain analysis (Ramamurthy 2000; Dunaway 2001, 2014; Barndt 2002), livelihood analysis (Ellis 2000; Allison and Ellis 2001; Salagrama 2006), and geographic theories of space and place and the way they inform global-local interconnections of economic transformation (Massey 1984; Corbridge 1986; Agnew 1987). The commodity chain perspective—variously referred to as “commodity systems,” “global commodity chains,” “global value chains,” “commodity networks,” and “systems of provision”—refers to an analytical framework focused on understanding the organizational and spatial structure and dynamics of food industries across geographic scale (see Sturgeon 2009). 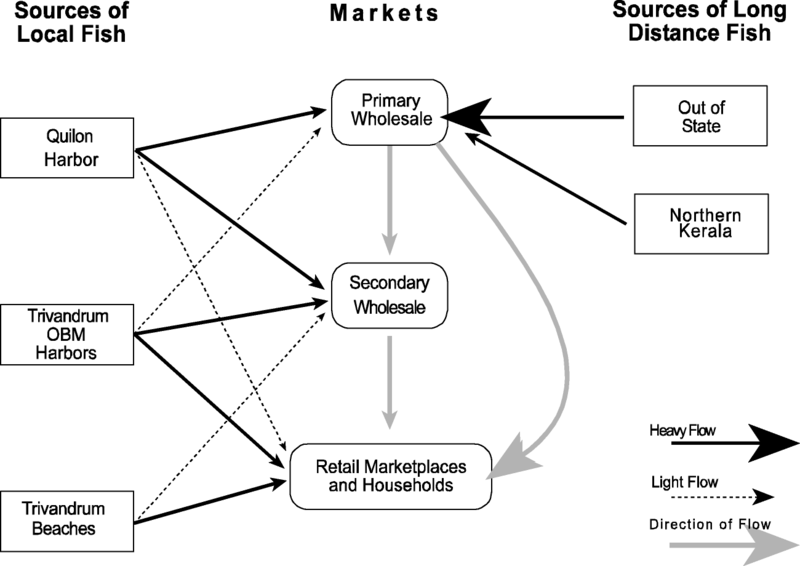 Commodity chains are networks of structured labor and production processes that connect actors to each other and to world markets across space (Bair 2009, p. 9). Commodity chain analysis studies a specific commodity from its origin in production to consumption (see Friedland 2004) through mapping linkages and examining the social relations of production and exchange along the various nodes that constitute the chain, including the institutions, governance structures, and power relations that shape chains and inform their internal dynamics (Sturgeon 2009). Feminist commodity chain analysis is distinct from mechanistic approaches (see Dunaway 2014) in that it focuses on people rather than things. It is explicitly interested in understanding the way each node of a chain is embedded in gendered relations within households and economies and asks a series of questions about both material and non-material processes that underlie the relations of production and exchange that constitute a given chain (Dunaway 2001, 2014). Following Jarosz (1996) and Ramamurthy (2000), our framework centers on the concept of “local divisions of labor” and investigates the way labor processes in specific places get reworked in relation to global-level economic processes and how social categories such as gender, ethnicity, class or caste, and religion shape the meanings people make and the actions they take, which in turn shape regional development and change, livelihood strategies, and agro-food industries themselves (Jarosz 1996, p. 41). We link processes of globalization to the production, processing, and distribution of fish, analyzing wherein women and men are the key agents at different nodes to map the consequences of global economic processes and state policies on men and women’s labor (paid and unpaid), the relationship of household politics to the politics of production and social reproduction, and the cultural constructions, contestations, and negotiations around gender ideologies as they inform local labor processes (see Ramamurthy 2000). To further understand the complexity and diversity of everyday experiences of globalization within and across different communities and households, we then link this gendered commodity chain analysis to an analysis of livelihoods. “Livelihoods” refers to “the assets (natural, physical, human, financial, and social capital), the activities [strategies of use], and the access to these (mediated by institutions and social relations) that together determine the living gained by the individual or household” (Ellis 2000, p. 10). According to this framework, individual and household livelihoods are shaped by local and distant institutions, social relations, and economic opportunities (Ellis 2000, p. 6). Assets and access (opportunities) interact to define possible livelihood strategies (activities) available to individuals or households in an iterative and ongoing process in which the various elements may change from season to season or from year to year as assets are built up and eroded and as access to resources and opportunities change “due to shifting norms and events in the social and institutional context surrounding … livelihoods” (Ellis 2000, p. 10). Livelihood research provides a rich understanding of how individuals and households construct a living at the local scale but has been critiqued for neglecting macro-level processes and structural shifts (Challies and Murray 2011), for paying insufficient attention to politics, power, and issues of governance, for engaging insufficiently with environmental issues, and for failing to adequately deal with processes of economic globalization and long-run trends in economic change (Scoones 2009). Livelihood research cannot simply be a cataloging of strategy households adopt to make a living (O’Laughlin 1996), rather analysis of livelihood strategies must be linked to the structural, historical, and institutional elements of broader scale processes of economic change (Murray 2001). Combining livelihoods with feminist commodity chain analysis, which considers the social relations of production and exchange as they are shaped by gender and other cultural identities, provides a means for accomplishing this. Finally, we draw on geographic theories of space and place, which are instructive in that even within a local economy, different communities, households, and individuals are connected to that economy in different ways through different types of production and exchange relations and different gender divisions of labor. According to this perspective, the dynamics of a changing world economy are always mediated by local conditions of existence, which vary in space and time and affect how those processes operate (Massey 1984; Corbridge 1986). As we shall demonstrate below, local impacts of globalization vary significantly across and within local communities even within a general gender division of labor because of the role that place particularities play in local articulations of global-level economic processes. Our approach thus is to look at the differential impacts of globalization on men and women, which are rooted in local gender divisions of labor and gender ideologies, assessing these in terms of their implications for fisherfolk livelihoods—in which gender norms and practices determine access to and control over resources and shape power relations underlying household or familial economic decision-making. 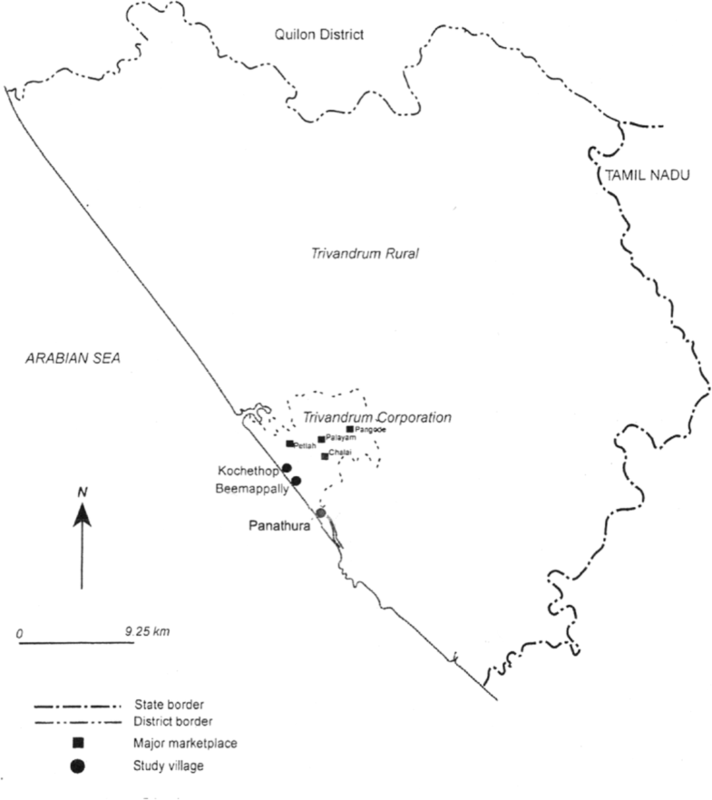 The site for this research is Trivandrum District (see Fig. 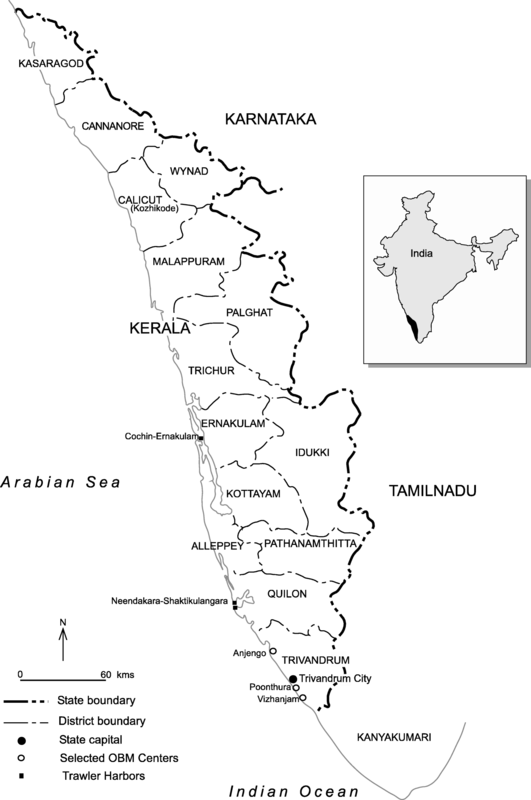 1), which has the largest fisherfolk population in Kerala State (Marine Fisheries Census 2005). Fishing is a caste-based occupation, but fisherfolk communities in Kerala are found in all three of the state’s religious communities. In Trivandrum, 81% of fisherfolk are Christian, approximately 18% are Muslim, and less than 1% are Hindu. Among fisherfolk, religious affiliation and native place are important aspects of individual and community identity and, thus, cultural processes embodied within local economies. For this study, we selected three villages, which are all part of the same local fishing economy but connected to it in different ways based on different endowments of fishing technology and different gender ideologies and divisions of labor. Our methodology adopted a “multi-locale strategy” in which we covered “a network of sites that encompass a process” (Marcus and Fischer 1986, p. 94). It included (1) extensive observations of fishing and post-harvest activities at numerous sites throughout the district; (2) over 200 in-depth interviews with fishermen, male and female fish traders, wholesale merchants, commission agents, auctioneers, social worker-activists, and government officials in charge of fisheries development over multiple years of extended field research (1994, 1999, 2005) and follow-up field visits (2008, 2011, 2015); and (3) 370 household surveys conducted in 2005 across the three study villages (113 in Beemapally, 121 in Kochethop, 140 in Panathura) that collected information on household composition, adult work histories, household assets, credit arrangements, divisions of labor and labor deployment strategies, financial management and decision-making, and notable events such as marriages, deaths, and injuries. We have used the data collected to map local gendered fish commodity chains and their transformations, and then develop an understanding of the livelihood strategies fisherfolk households are adopting to cope with economic change and how these are shaped by intersections of different local gender norms and ideologies and processes of globalization in the sector as a whole. The format of this paper is to first describe the present-day fish economy in Trivandrum in terms of its market structure, commodity chains, and gender divisions of labor. We then briefly discuss the globalization of Kerala’s fisheries through state-led economic development and the impacts of this development on fish production, processing, and distribution. Next, we turn to the study villages, and using the stories of individual households, we illustrate and discuss the different ways households have adapted their livelihoods to these changes. We conclude by discussing how the various strategies adopted in different communities are informed by community and household situations and local divisions of labor. Figure 2 depicts the structure of the Trivandrum marine fish market, which is constituted by commodity chains that originate in several different places, including local beaches and landing sites where manually-driven craft/gear and outboard motorboats (OBMs) land; a modern harbor in neighboring Quilon District where mechanized craft (trawlers, purse seines) land; and distant modern harbors in northern Kerala and surrounding states. Marine fish commodity chains consist of three basic nodes—harvesting, processing, and distribution—and sets of ancillary activities supporting production, such as boat construction, net making and repair, ice provision, loading, and credit. However, the specific configuration of these nodes in terms of actors, divisions of labor, and production and exchange relations varies depending on the following: type of fishing craft and gear (mechanized/OBM/manual); landing site (harbor, beach); species of fish (fin fish/seafood); size of landing; market destination (export/domestic); and distance to market (local/long-distance). The basic process is that fish is landed in a harbor or on a beach where it is then usually sold via auction to merchants and traders who take it to various marketplaces where it is resold either in smaller lots to small-scale traders or in very small lots directly to consumers. In some cases, women family members of boat owners take fish directly to market. At other times, a boat’s entire landing may be sold to a single merchant who has made a prior purchase arrangement. Certain varieties of fish may be purchased for processing, i.e., dried or salted, or in the case of seafood, peeled and frozen. Sometimes fisherfolk households retain their harvests for their own consumption. The particular mode by which fish is handled post-harvest depends on scale of production technology and the volume and type of species of fish landed. Generally, the more industrialized and larger scale of production, the more complex and hierarchically ordered the commodity chain and its actors. In Trivandrum, the fishing fleet is predominantly artisanal, consisting of manually driven craft and outboard motorboats, and scale of production is relatively small. The fishery is characterized by multiple species landed in relatively small quantities. Whereas fish arriving in the Trivandrum market from distant places is transported in bulk by large-scale merchants to primary wholesale markets where it is sold by the crate-load, fish landed locally tends to be sold in smaller lots to small-scale wholesalers and retail vendors and goes primarily to secondary wholesale markets or directly to retail marketplaces and consumer households (Kurien 1984; Hapke 2001a). The gender division of labor within the marine fish economy as a whole in Trivandrum is that men fish, women process the catch, and women take it to market, but this varies by community. In Christian fisherfolk communities, this is the norm. However, among Hindus, in some villages women process and sell fish, in others they do not. Among Muslims, women dry fish, and some women engage in fish trade, but those who do are usually extremely poor and from female-headed households. With rare exception, men from all three fisherfolk communities do not engage in fish trade. However, in addition to women fish traders from fisherfolk communities, men from non-fisherfolk communities also engage in fish trade. In Trivandrum, there are two such groups: men from non-fisherfolk Muslim merchant communities and a small number of men from a community of ethnic Tamil Christian fisherfolk who migrated to Trivandrum from Kanyakumari (see Fig. 1) in the late nineteenth century and reside near one of the large urban marketplaces in Trivandrum city. Labor within the local marine fish commodity chain thus is gendered in the following way: harvesting is occupied entirely by men from fisherfolk caste communities; processing (drying) is performed by women in home-based production1; and distribution is occupied by both men and women, but working in different capacities. Within the distribution node, men are found throughout the fish market hierarchy but dominate its upper echelons as large-scale wholesale merchants, commission agents, and auctioneer-financiers. While some women act as auctioneers (on local shores and in secondary wholesale markets) and as small-scale wholesale traders, the vast majority are small-scale retail (headload) vendors (Hapke 2001a). The present-day structure of the Trivandrum fish market and the commodity chains and divisions of labor that comprise it are the outcome of several decades of state-led development. After a brief period in the 1950s in which state efforts focused on increasing production for domestic consumption, fisheries development in Kerala has been strongly driven by efforts to take advantage of global markets for prawn and seafood through the introduction of mechanized trawlers, ice and refrigeration technologies, and the construction of modern harbors (See Kurien 1994). This technological transformation entailed sweeping economic and social transformations as well as considerable conflict in the 1970s, 80s, and 90s, which subsequently prompted the government to subsidize fisherfolk welfare through loans and grants to purchase more affordable outboard motor boats and to construct houses. During the same period, neighboring coastal states in India also developed their marine fisheries to substantially increase production, and large volumes of this fish enter markets for domestic consumption in Kerala, including Trivandrum. This is because, in contrast to most of these states, Kerala has a strong domestic culture of fish consumption, and its consumer markets have been able to absorb the increased inflow from out-of-state. A geographical shift in fish harvesting from highly decentralized landing sites along the coast to centrally located harbors in a few key sites that can accommodate the new trawler and outboard motor boats. A sectoral split and differentiation within and between fishing communities as those located most advantageously to the new harbors or with access to greater sources of capital have benefited most from the new technology. An increase in the volume of fish from long-distance sources in Kerala’s domestic markets. Overcapitalization and ecological crisis caused by overfishing—felt especially in the artisanal (non-motorized) sector—which continues to constitute about half of the fishing fleet in Trivandrum District. Larger, faster boats produce larger-sized landings, and long-distance fish arrives in bulk, which has generated a new geography of fish markets and distribution characterized by (a) increasingly complex commodity chains linking fish producers in Kerala to export markets and fish traders to new sources of fish supply; (b) the commercialization of exchange relations; and (c) increased stratification of marketing networks in which large-scale merchants and commission agents dominate. Ice and refrigeration technologies have led to a decline in traditional fish-processing activities (drying, salting), while global export markets have led to the emergence of new-processing industries (peeling, freezing) along India’s coast that employ large numbers of women, mostly from Kerala. Technological innovations in net production have led to the replacement of handmade natural fiber nets with machine-made nylon nets. These outcomes have played out in distinct ways within each node of the commodity chain, and examining the gendered divisions of labor within commodity chains lends insight into the general pattern of globalization’s impacts on men and women fish workers in a given region. However, extending analysis to the level of the household and questions of livelihood provides a more nuanced understanding of how global economic processes impact households and individuals in particular ways. The different ways fishing communities and households have adapted to these changes in terms of livelihood strategies vary considerably by the specific way in which they are connected to the local fish economy and by different norms and ideologies about gender and identity and fish work. To illustrate these differences, we profile individuals that represent different experiences of the economic transformations taking place across three different fishing communities. The villages selected for this study are located on the outskirts of Trivandrum City, the capital of Kerala State. They are Kochethop, a Christian fishing village; Beemapally, a Muslim fishing village; and Panathura, a predominantly Hindu fishing village2 (see Fig. 3). The history of these different communities is rather unclear, but oral histories we collected suggest that in contrast to the Christian fisherfolk of Kochethop who have always lived and fished in this region, the residents of Beemapally migrated to Trivandrum from the neighboring district of Kanyakumari sometime in the late nineteenth century and took up fishing after their arrival. Residents of Panathura claim that its history is connected to minting currency for the king of Travancore,3 and although Hindu men in Panathura engage in fishing, they are also engaged in coir production and other occupations. In addition to religious affiliation, the three villages are differentiated by the type of craft and gear used to fish and gender divisions of labor within fishing. Christians utilize the widest range of craft and gear and are generally recognized as the most skilled fishermen with a strong sense of individual and community identity linked to fishing. The gear they deploy includes the kattumaram (a small canoe constructed of 3–4 logs bound together), beach seine nets set by large canoes called kambavala, outboard motorboats, and numerous types of nets and hook and line gear. In Panathura, only beach seines (kambavala) are used. Prior to 1995, some kattumaram were purportedly in use in Panathura, but informants reported that the construction of a sea wall to prevent erosion around that time prohibited their use locally so they were sold. The sea wall has not prohibited kambavala fishing in Panathura, but it has made it more difficult and with declining harvests, less viable over time. Beemapally fishermen also predominantly use beach seines, but a small number of households own and use kattumaram. Community identity as “fisherfolk” seems to be weaker in both Panathura and Beemapally than that in Kochethop, and historically, there has been greater occupational diversity in both these communities than in Kochethop. In addition to their work in fish processing and trade, women in Kochethop are also responsible for household chores (cooking, cleaning, childcare), procuring goods for household consumption, securing medical care for ill family members, and managing household expenditures and finances. Women, furthermore, arrange marriages, raise dowries, secure loans, and are generally responsible for the daily reproduction of their communities. Because men’s lives are oriented toward the sea, Christian fisherwomen’s economic and domestic duties, in effect, position them as the mediators between the household and the society at large (see also Ram 1991). That is, they are the individuals who interact with social and economic institutions such as banks, schools, or government offices on behalf of their households and perform the tasks of obtaining goods for household consumption, securing loans, applying for utility service, arranging medical care for family members, and so on. This marks a departure from most of Kerala society in which men act as the mediators between household and society. Tracy was 60 years old when we interviewed her in 1999. She lived with her husband, age 70; a son, age 26; 2 daughters, ages 20 and 23; a son-in-law, 32 years old; and a 2-year-old grandchild. She was working as a small-scale retail vendor in a city marketplace. She had been “going to the market” regularly for the past 20 years but actually began her career before marriage—at age 15. After getting married, she stopped for a while. About 30 years previously, she and her husband bought a large canoe and beach seine net, which they had for 10 years, during which time she managed it—keeping track of how much fish was sold, who worked, etc. During this time, she did not go to the market. Then the boat was wrecked, so they sold the net; Tracy started going to the market again, and Varghese would migrate to northern Kerala every year to work on trawlers and send money home. He then developed diabetes and had to stop working around 1992–1993. At the time of the interview, Tracy’s household was surviving on her income from fish vending and her son and son-in-law’s income from fishing locally. Selin is 35 years old; Augustin, 39. They have two children, 15 and 13 years old. Both attend school. Augustin’s father, who is retired, also lives in their house. Selin works as a fish vendor. Augustin is a fisherman who has owned his own boat for most of their married life. First, he owned a kattumaram, which was purchased with her dowry funds. For the past 6 years, he has owned a Yamaha outboard motorboat (OBM), which they purchased partly with a government loan and partly with private loans. Selin started going to the market with her mother at age 10 and then started her own business after 4 years. After marriage, she moved to her husband’s village and began selling fish in nearby marketplaces. When they had the kattumaram, Selin took her husband’s fish to the market only if shore prices were too low. They would try to sell it on the shore itself first. Now that he owns an outboard motorboat, she will take whatever of the catch she can handle (as a headload) and the remainder will be sold on the shore. If her husband does not have a catch, she goes into a city wholesale market and buys fish to sell, or she buys fish from another fisherman on the shore if it is available. In Tracy’s household, we see cyclical patterns of boat ownership and loss; Varghese migrating to work while he could, but the household then relying on her work in fish vending and the young men’s work as hired fishermen, which is somewhat precarious. Selin and Augustin have been more fortunate. Selin’s skill in fish vending and financial acumen underlie her household’s ability to acquire first a traditional boat and then later build on this asset base to acquire an outboard motorboat. She and her husband also provide an example of how a couple combining their skills and independent activities as well as being able to take advantage of government programs has been able to weather the challenges globalization. In Beemapally, the gender division of labor differs significantly from Kochethop in several ways. Women are responsible for domestic chores and manage their household’s finances.4 However, whereas “domestic” for Christian fisherwomen in this region includes a wide range of activities that take women out of their homes and villages to procure food and other essential items, these boundaries are more circumscribed for women in Beemapally. For example, in most of the households surveyed, young children or men are sent to do the shopping. Similarly, in terms of organizing loans, women draw on their personal networks of friends and relatives to borrow gold and/or cash, but loans required from formal sources or from moneylenders are usually arranged by men. While women do have their own neighborhood social networks with which they interact, the mediators between households and society at large in Beemapally are men. Although women do not take fish to the market today, several elderly men and women reported that their mothers took fish to the market to sell, and some of the elderly Christian women we interviewed remember Muslim women going to the market many years ago. To the extent that Beemapally was at one time an extremely poor community, there likely were a number of women fish vendors. One 70-year-old informant estimated that about 50 women from Beemapally used to go to the market to sell fish. However, this activity seems to have never been gendered as feminine in the way it has been in Christian villages. Muslim women do work in fish processing (drying), though this has declined considerably in recent decades, and prior to the early 1980s when machine-made nylon nets were introduced, women in Beemapally made and repaired nets. Rahila Beevi is 61 years old. Her husband died about 18 years ago. She lives with her daughter whose husband has been in the Gulf for the past 3 months. Rahila has two other daughters and two sons who are all married. One son is a fisherman, and the other is in the Gulf. Rahila’s husband had owned a kattumaram for about 20 years, which was sold when he died. Prior to owning a boat, he worked for another fisherman. Rahila used to take her husband’s fish to the market, and she managed his boat. For the past 32 years, she has owned a vegetable business, and like her mother and grandmother, she made nets from the time she was very young (5 or 6 years old) until machine-made nets were introduced in the early 1980s. “Owners” would bring them material, and they would get a piece rate. But, she says, “Nylon [nets] killed my livelihood.” Rahila also used to dry fish on the nearby shore. Dry fish dealers used to come to Beemapally to buy fish, or women would take it to the market. Even now if there is a large landing of fish such as anchovies, women may buy it and dry it in their homes to sell. Her daughters, however, do not dry fish, and they never made nets. They are both housewives. Rahila Beevi’s experience tells the history of Beemapally. Previously, both women and men worked in fishing or fishing-related activities as well as other activities (vegetable vending), but with the economic shifts within the fishing economy combined with increased prosperity from Gulf migration, women’s work in fish processing and net making has declined considerably, if not disappeared entirely. Gulf migration and housewifization (see Hapke and Ayyankeril 2018) increasingly define her children’s livelihood experience. In Panathura, women are not involved in the fish economy at all. Instead, they work extensively in the production of coir, a fiber derived from coconut husk. Coir production in Panathura is a household-based activity5 in which both men and women engage in gender-specific ways. Unlike fishing, which is highly seasonal, coir production takes place year-round, and though low-paid, it does provide a steady flow of income into households. Women also attend to household tasks and may or may not manage household finances. In Panathura, who manages household finances seems to be a matter negotiated between a husband and wife, though it is more often men. Women enjoy a fair degree of mobility around the village and nearby places, but men act as the mediators between household and society. Balaandan is 60 years old. His wife, Sreemathi is in her 50s, and they have three children; two daughters, ages 27 and 24 and a son, age 22. The eldest daughter is married to an electrician and lives in another fishing village. Balaandan works as a fisherman on a beach seine in which he owns a share.6 He purchased the share in 1994 for Rs 13,000 (US$ 413) and at the time of the interview had still not recouped the investment. The boat/net has been running at a loss due to labor shortages, spatial constraints due to the sea wall, and declining harvests stemming from overfishing and increased competition from an increase in boats in surrounding villages. Fishing had been his main job, but in the past 4 years, coir has become his main source of income. Balaandan fishes in the morning when it is possible to fish and then does coconut husk retting in the afternoon for a wage. He and Sreemathi also make coir rope, which they have been doing for about 30 years. He buys retted husks, which Sreemathi and their younger daughter peel and beat, and the three of them then spin the fiber into coir rope with a ratt (manually operated apparatus for spinning coir) they have owned for about 30 years. His son helps with fishing but does not do coir work and is trying to go to the Gulf. Income from the sea is uncertain; coir provides a steady, assured income they use to cover school fees and other incidental expenses. But, Balaandan is heavily in debt from the boat and from the expenses of his eldest daughter’s marriage. In Balaandan and Sreemathi’s story, we see a declining fishery in Panathura and the shift in Balaandan’s work effort toward coir work to compensate, which supplements and supports his wife and daughter’s coir work. We also see a movement toward other occupations (the son-in-law who is an electrician) and the effort to send a son to the Gulf. However, indebtedness and economic stress are apparent. Collectively, these stories illustrate the diversity of experiences of globalization, even within the same local fish economy, as structural changes in fishing, fish marketing, and fish processing have impacted different groups of men and women in different fishing communities in distinctly different ways. Different gender divisions of labor and village situations shape the ways men and women as groups across the three communities experience globalization and forge adaptive livelihood strategies. The impacts of changes in production on men depend on whether they own boats or work as laborers for others (access to livelihood assets); the type of craft/gear and crew size; range and area of operation; targeted species; and intended market outlet (domestic or export). Craft and gear configurations determine where fishermen can operate (onshore, near-shore, offshore) and the size of area that can be covered in a journey. Outboard motorboats (OBMs) can cover a fairly wide range, but kattumaram can travel only as far as their crews can paddle. Beach seines operate completely locally. A strong sense of native place and insider/outsider status prevents fishermen from being able to land or operate just anywhere. This technological-geographical factor, in addition to knowledge and skill and the physical characteristics of local fishing grounds, determines the type of fish harvested, the size of individual landings, and where one lands fish, which in turn all influence market access and income. Furthermore, the sectoral split and geographical shift in landing sites bear significantly on marketing outlets for fishermen since merchants prefer to purchase fish in bulk in one place rather than travel to multiple sites up and down shore. In the new geography of fish production that has emerged, fishermen in the non-motorized fleet tend to have less access to new harbors and landing centers, so are less connected to export markets and have fewer options for selling their fish domestically than do fishermen in the motorized and mechanized sectors. Within the non-motorized, artisanal sector, the least mobile fishermen are beach seine fishermen in Panathura and Beemapally. Within production then, the main impacts include overfishing, declining harvests in the artisanal sector, and declining incomes from men’s work in fish harvesting. Strategies men have adopted to cope with these impacts differ in each community and by the type of fishing in which they are engaged as well as skill level, age, and the extent to which men’s personal sense of identity is tied to fishing as an occupation. In Christian fishing villages such as Kochethop, where fisherfolk caste identity is strong, men’s strategies have centered primarily on fishing. Some fishermen, such as Augustin, have attempted to intensify their effort by acquiring new technology, specifically OBMs, but success with this strategy has been mixed (see PCO and SIFFS 1991). Others, like Varghese, have migrated to other parts of Kerala to work as wage laborers on mechanized trawlers. Many others are simply under- or unemployed. For Muslim and Hindu men in Trivandrum, the main strategy is to migrate to the Persian Gulf to work if they can raise the funds necessary to arrange a visa. Men in Beemapally began migrating to work in the Persian Gulf states around 1977–1978, and most families have sent at least one male family member to the Gulf since. Those who cannot raise funds to migrate or who have spent some time there and have returned take up second and third jobs in non-fishing occupations. In Panathura as well, male migration to the Gulf has also become a strategy. Those who cannot migrate continue to fish, but they take up second and sometimes third jobs as laborers, painters, electricians, mechanics, auto rickshaw drivers, shop clerks, restaurant workers, and/or they work in coir. The use of beach seines, which operate in the early morning for a couple of hours, allows men to go to other jobs later in the morning. Adult work histories in both Beemapally and Panathura reveal that men in these two communities have long engaged in multiple occupations in addition to fishing, and one does not get a sense of strong identity associated with fishing. With respect to distribution, the market system has become highly stratified with women concentrated in the lowest echelons. Commercialization has had both positive and negative effects on women fish traders. Fish is available year-round; the expansion of the middle class has increased consumer prices and profit margins, and many women, such as Selin, make very good incomes. On the negative side, the need for capital, centralized landing sites, and bulk landings combined with cultural factors limiting women’s mobility has placed women at a disadvantage in the market, at the same time, the local ecological crisis has increased household reliance on their work in fish marketing for survival (see Hapke 2001a, b). Yet, many women in Christian fishing villages such as Kochethop continue to work in fish marketing, and this remains the most viable livelihood for them. The introduction of machine-made nylon nets in the early 1980s replaced women’s home-based work in net making and repair, thereby depriving them of a source of income, as Rahila Beevi attests. This has most impacted Muslim women in Beemapally. Almost all women engaged in this activity prior to 1980 as a home-based activity. However, with the exception of a few older women who occasionally get net repair work, no one works in this activity anymore. Instead, with remittances from Gulf migration constituting the bulk of household earnings in Beemapally, women have withdrawn from remunerative work and become “housewives” (See Hapke 2001b; Hapke and Ayyankeril 2018). As the foregoing analysis illustrates, not only do men and women experience globalization differently as a result of the different ways they are situated in fish commodity chains, even within the same local economy, men and women’s livelihood options and adaptations differ across fishing communities as a result of different configurations of gender, identity, and work. In Christian fisherfolk communities, households continue to rely on both men and women’s work in the fish economy, but dependence on women’s work in fish marketing seems to have increased. While the fact of women working is not new, the extent to which fisherfolk households depend on it may be, and this surely has ramifications for household gender relations that impact women’s lives. In the Muslim and Hindu villages, men have been moving out of fishing. Gulf migration is prevalent particularly in Beemapally, but many men in Panathura have also migrated to the Middle East for work. Women in Panathura continue to work in coir, but increasingly, wives of Gulf migrants are becoming housewives, and nearly all women in Beemapally below the age of 55 are housewives. What this shift will imply for women’s autonomy and gender relations within the household, and hence livelihoods, is also potentially profound but in different ways than so for Christian fisherwomen. Finally, diversification and mobility out of fishing are two clear strategies that fisherfolk households in all three communities, and across the region, pursue. Young people in many households, including Christian communities, are acquiring education with the hope of moving out of fishing altogether, and those households that are able diversify most tend to be better off than those who are not. The extent to which individuals and households are able to do this, however, depends on the ability to secure education and other productive assets as well as opportunities in the wider economy, which are currently limited by widespread general unemployment. Our objective in this study has been to investigate the impacts of globalization within fisheries on local fishing communities and the livelihood strategies fisherfolk households have adopted to cope with these impacts. Utilizing feminist commodity chain analysis attuned to gender divisions of labor within nodes of commodity chains combined with livelihood analysis and attention to geographic difference (place) reveals the nuanced ways in which labor processes in specific places get reworked in relation to global-level economic processes and how social categories such as gender, ethnicity, class or caste, and religion shape the meanings people make and the actions they take. As the case study stories presented above reveal, the structural changes within production, processing, and distribution of fish effected by globalization present different stresses and opportunities for men and women fish workers. Different gender divisions of labor across the three communities studied, combined with different endowments of physical, financial, social, and cultural capital, influence livelihood options and the strategies individuals and households forge in response to economic transformation. Thus, globalization in the fisheries plays out differently for men and women in different fishing communities as a result of different configurations of gender, work, culture, identity, and economy and the different ways households and communities are connected to fish economies at different scales. Identifying these differences offers a means by which we might both broaden and deepen understanding of the gendered nature of globalization in resource-based economies. In other parts of Kerala where there are modern harbors landing prawn for export, women are employed in seafood processing (peeling for freezing). They work in factory settings typically supervised by men and may or may not be from fisherfolk communities (see Aleyamma 1995). Historically, Panathura was inhabited by both Muslims and Hindus; however, over the past two to three decades, most of the Muslim households have moved inland. By the time we first surveyed the village in 2005, there were only about 5 Muslim families (households) living in the village. Informants report that only Hindu men in the village engaged in fish harvesting. Muslim men in the village worked as fish vendors. Trivandrum was the capital of the erstwhile State of Travancore, which existed from 1729 until 1949. After Independence, its territory was rearranged and merged with other Malayalam speaking districts, and the territory was renamed Kerala in 1956. The exception is wives of shopkeepers. Male shopkeepers also manage household expenses, but in nearly every other household we surveyed, women reported managing funds, and men reported turning over their incomes to either their wives or mothers. Coir is also produced in factories, and there is a factory nearby to Panathura that employs women from a different caste community (Ezhava). However, in Panathura, it is a home-based industry. In Panathura, beach seines and the large canoes that are used to launch them are owned in a share system in which 30–35 people (men and women) own shares. This system has evolved as a way to ensure labor, which has become in short supply with Gulf migration and young men seeking alternative employment to fishing. In 1999, we interviewed one woman who worked in fish drying. She mentioned there were a couple of others who dry fish. No one reported this activity in our 2005 household survey. Support for this research was provided by the U.S. National Science Foundation, a Fulbright-Hays Faculty Research Abroad fellowship, the Association of American Geographers Anne U. White Fund, Syracuse University, and East Carolina University. All findings, conclusions, and/or recommendations are those of the authors alone and do not reflect the view of the National Science Foundation or U.S. Department of Education. We would like to thank the editors and reviewers for their comments and suggestions. Salagrama, V. 2006. Livelihoods in fisheries: what can we do? Discussion paper for FAO-UNTRS. Accessed on-line at: http://www.onefish.org/servlet/CDSServlet?status=ND0yNDM3MzMmY3RuX2luZm9fdmlld19zaXplPWN0bl9pbmZvX3ZpZXdfZnVsbCY2PWVuJjMzPSomMzc9a29z. November 2008.